I have the “Folsom Prison Blues” blues . . . I have a confession to make. No, it’s not the murdering kind that many of my once 93 guys made. Mine may be more shocking, actually. Ok, here goes. There, I’ve said it. And I’m not ashamed—I even feel better. (He did in fact spend time in a Texas pen for drug possession charges). 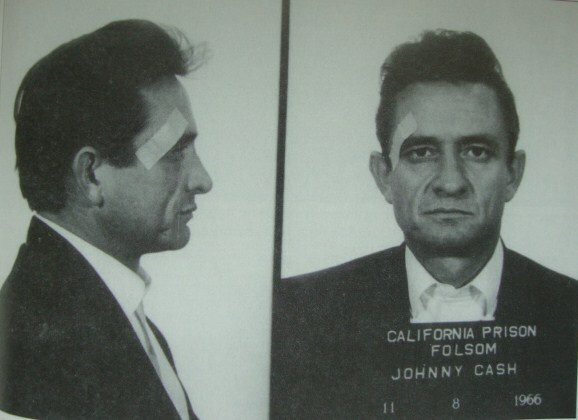 In his book, Folsom Prison, Jim Brown explains that Cash had this mock mug shot taken as a joke. Brown notes that the bandage is presumably designed to make people think guards roughed the singer up a bit. Saul Holiff, son of Cash’s one-time manager, Jonathan Holiff, donated this “mug shot” to the Folsom Prison Museum in 2007. So what’s my angst with the song? It developed over time. My book covers the years of 1895-1937 and when I began my online research, “Johnny Cash” and his 1960s hit, “Folsom Prison Blues” dominated the results. I promised myself (and everyone else) that I’d give it a listen one of these days. I meant it, too. As time went on and more Johnny/Folsom stuff kept infiltrating my research, I grew bitter, determined to show that Folsom prison is more than just a song. People assume I’ve heard this popular prison tune and are usually flabbergasted when I tell them the truth. I’ve evolved into one of those curmudgeons, stuck in their ways; holding onto an irrational gripe about something silly, for no apparent reason. When I toured the prison this last January, we strolled past the spot where the concert took place. When the guard pointed it out, you can bet I rolled my eyes. I know, it’s terrible. I developed this absurd hated for a song I’ve never heard. For those of you who don’t have this illogical aversion to “Folsom Prison Blues,” I’ve included a link to several renditions of this song. Knock yourself out. TELL ME: HAVE YOU HEARD THE SONG? DO YOU HAVE A FAVORITE VERSION? 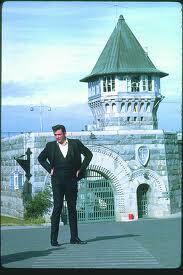 Categories: Folsom History, Research | Tags: Folsom history, Folsom Prison Blues, Johnny Cash, writing | Permalink. Fun post, April. I attended a live Johnny Cash concert one time — in Indiana in the 70s, so not only have I hard the song, I can’t imagine any other version than the one I heard that evening. It was a really good concert. Oh wow–now that probably would be your favorite version–what a great opportunity! I’ve never heard it. Love that fake mug shot! Thanks for sharing it. I’ve heard it, but I don’t know which version. April, have you ever broken down and at least read the lyrics? I’ve never heard it. I’ve heard of it. I’m the same way about certain things when I’m writing–sometimes I restrict myself because I don’t want to be influenced by another work of art. But aren’t you curious? Are you going to listen to it when you are finished with your book? Ok, I’ll admit it–I am curious about the song. And yes, I think once I’m done with the book and have a published copy in one hand *fingers crossed* I will listen to the song with a glass of champagne in the other hand! Well, Tyler…you’re certainly entitled to your opinion, just as I am. Isn’t freedom of speech great?